How long can you keep the railway running smoothly? Electric blue, red and green trains approach – can you guide them to the right stations and safely away without crashing? Switch the points to send the trains to the correctly colored stations. Tap the trains to speed them up and avoid collisions. Once you’ve delivered your passengers, send the trains on their onward journeys to make room for new arrivals at the junction. 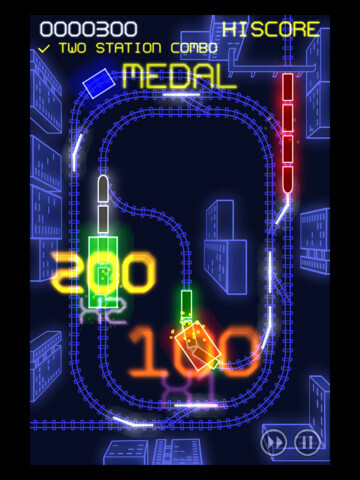 Simple controls – tap to switch points, tap to speed up the trains. Perfect for any train journey, long or short. Super-smooth even on first-generation devices. Electrotrains has six different maps – some easy, some hard. Features stylish electro-looks, and support for retina display on the newest iPhone and iPod models. Get medals for your in-game achievements – can you collect them all? Compare your score with other players around the world. Ranked #1 in Games/Strategy in App Stores around Europe when it went free for 2 days.